"Waterfront" takes on a new meaning at The Boathouse, which sits directly over the waters of Muscongus Sound; an area is well known for some of the best kayaking in Maine. Guests are treated to panoramic views of the water and islands, and can easily watch local lobstermen at work. The interior is comfortably furnished and features a unique barn wood paneling that accents the traditional nature of the building. The large surrounding yard is shared with "The Cottage" (#82A), but is nicely separated for privacy. The peaceful setting is close to Round Pond and all Pemaquid attractions, making it a convenient location for exploring the area. Tanya is competent, friendly and follows up every email promptly. We feel blessed to be able to stay at the Boathouse in Bremen. We tried a few different areas of Maine, stayed in a wonderful cottage last year on a lake, but ended up driving to Damariscotta anyway. 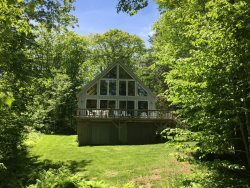 This area of Maine is just the best we've found, and the cottage is peaceful and private. This was our 7th stay in this location, and we've decided we are never going anywhere else, it just can't be matched! Easy! Like the fact you take credit cards now too! Love! I really dont want to tell people about it... b/c o treasure the fact that the area is off the normal tourist path! I LOVE Tanya! Such a pleasant on-line personality. It was wonderful meeting her for the first time in person this year. Thank-you, Thank-you, Thank-you for allowing us to share your beautiful home with us.